A few months ago I exchanged books with someone who is also very interested in brain science. 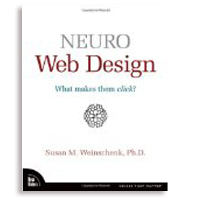 In fact, she calls herself ‘the brain lady.’ Susan Weinschenk, Ph.D, recently wrote Neuro Web Design: What makes them click, which should be of interest to those involved in web strategy and design and really, to anyone interested in human behavior. Through research studies told as stories, Weinschenk provides a fascinating look (visit site here for more details) at why we behave and act as we do online. She then applies this information to designing the user experience, which of course, translates into many web design decisions and choices. Neuro Web Design is quite user-friendly and a fun read, with contemporary research supporting the many principles within. Her mix of psychology, user experience and design strategy held my attention, because I think the synthesis of varied fields is more intriguing and comes closer to the truth than highly specialized thinking in just one domain. The book has 11 chapters, with the first providing a foundation for understanding the key point: much of what influences our behaviors and decisions is neither conscious nor logical. 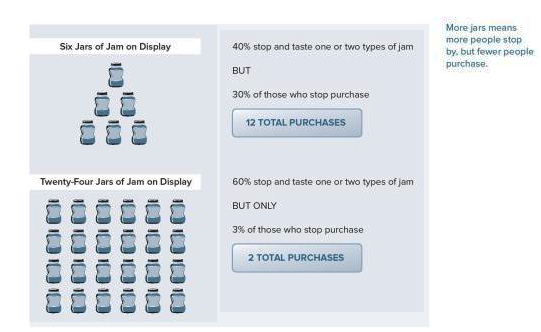 The principles in the remaining chapters run the gamut from explaining how to promote feelings of social validation, similarity and commitment on a website to understanding how insecurities related to loss and scarcity affect our buying decisions. 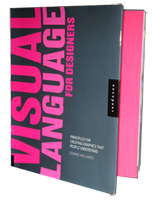 There are many more themes in the book, like why telling stories, using pictures and limiting a user’s choices are effective ways to persuade. Let me walk you through Chapter 5—Choosing Carefully—to give you a sense of the book’s rhythm. It begins with a personal story the author narrates about buying a hard drive. Because there were an abundance of similar choices on the hard drive site, it prolonged her agony over the buying decision. She had to return to the site and rethink her decision many times. Bottom line: Too many choices can be overwhelming. These anecdotes at the start of each chapter help readers understand its theme, because they’re familiar experiences. Chapter 5 then proceeds through several studies to explain what underlies the choices we make online and what affects our purchasing decisions. The author teaches us how to talk to the old brain and to the mid brain in an effort to encourage people to click. You’ll find a nice touch at the end of each chapter too. The main points are summarized in just a few lines. This is an effective way to help readers remember the lessons and also can be used as a quick reference when needed. I’d say that Susan Weisenchenk is a talented storyteller and writer. 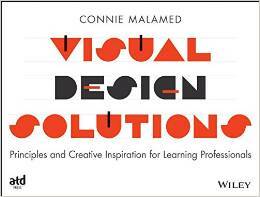 She knows the power of stories and uses them to teach us how to conceptually design more compelling websites by understanding human behavior. Stop by her own site, What Makes Them Click. And check out Neuro Web Design on Amazon. If you liked this article, share it using the social tools below. Your review of the book made me feel like going to the nearest bookstore and getting a copy of the book for my personal use. Thanks for sharing, it does seem to be an interesting and useful read.